Building an energy efficient home is the combination of using better building materials, and ensuring that everything from the appliances down to the lights are utilizing greener technologies. Of course, the true mark of a really great home, is one that’s a net zero home. 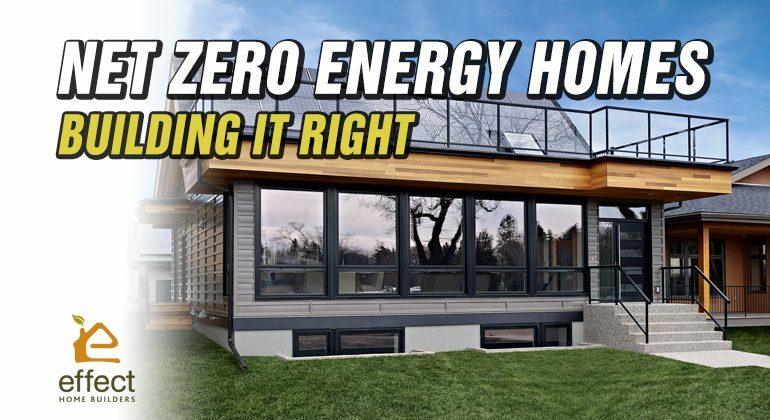 What are Net Zero Energy Homes? 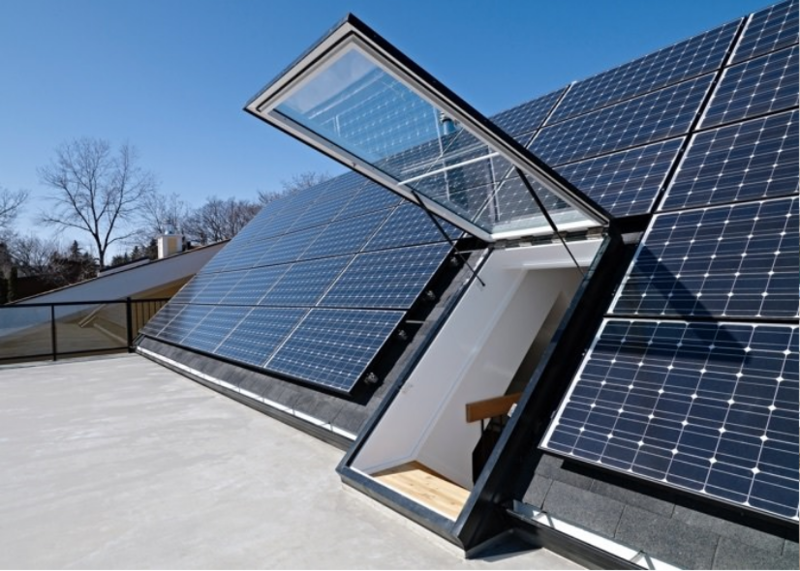 To put it simply, a net zero energy home produces as much energy as it uses. Utilizing solar and/or wind, net zero energy homes take in renewable sources of energy, combine that with a home that’s built to run with energy efficiency in mind, and give you a home that doesn’t wreck the planet. At the end of the day, it means cheaper utility bills for the homeowner. In some cases, you’ll even be able to sell power BACK to your municipality. 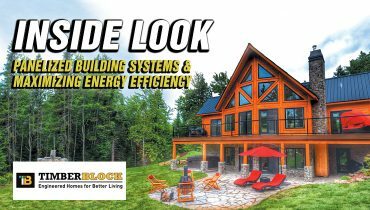 If you’re looking for a custom home, Effect Home Builders in Edmonton, Alberta, can build you an energy efficient, net zero energy dream home. And because we are part of the Holmes Approved Homes program, we invite Mike Holmes Inspectors to conduct assessments of our build during various stages of construction. 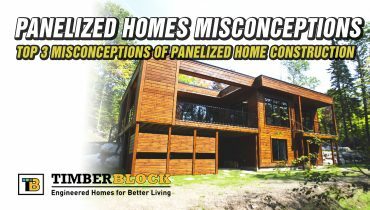 What are the specific components of a Net Zero Energy home? It all starts with a strong, energy efficient building envelope. 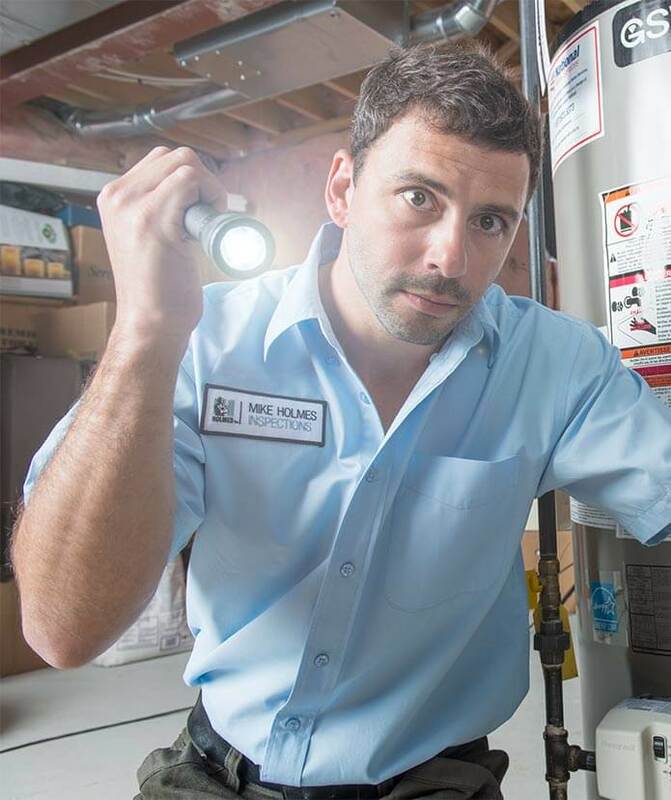 If your home is full of leaks and gaps, it’s going to make heating and cooling your home much less efficient. With BASF you get walls with nearly twice the insulating value. 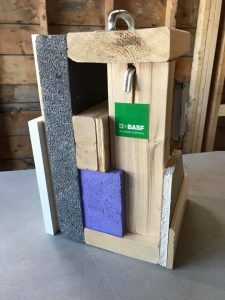 Starting with the BASF HP+wall construction, you get walls with nearly twice the insulating value of standard wood framing and able to better withstand severe hot or cold weather. Spray foam insulation and exterior Neopor foam insulation offer great insulating powers – and increase air-tightness for a home (because you don’t want air leaks leading to heat loss). Good windows make a big difference. Energy Star triple-paned windows, when installed properly will reduce air leakage and improve energy efficiency, as well as cut down on weeping windows in cold weather. Your choice of roofing material matters as well. 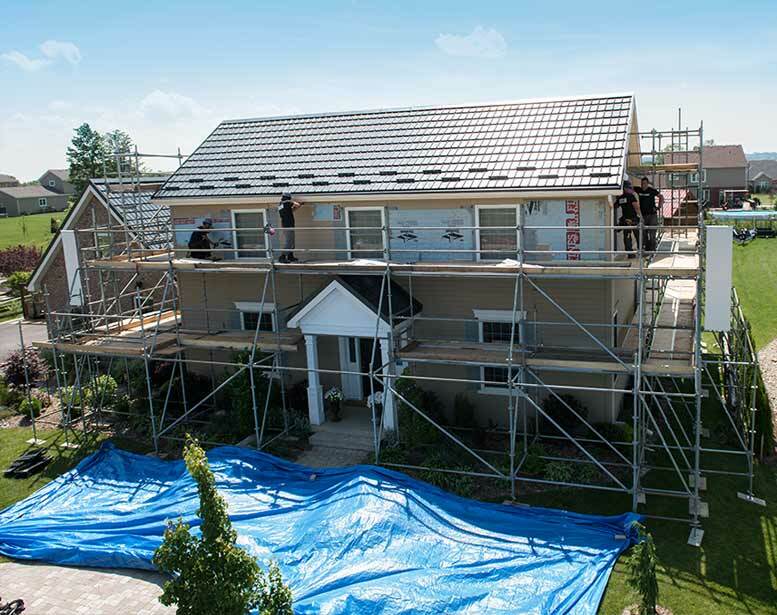 Mike Holmes loves a metal roof – and for good reason! They’re more energy efficient, more durable, and last longer (upwards of 50 years). And because it’s so long lasting, you don’t need to worry about replacing the roof after you install your solar panels. A huge win for netzero building. With the BASF HP+wall construction, you get walls with nearly twice the insulating value of standard wood framing. For most homeowners chasing after a net zero energy home – solar panels are the simplest solution for generating the energy they need. If your home generates more power than it needs, you can sell power back to the power company in a process called net metering. A meter is hooked up to measure electricity going both ways – power that comes in from the utilities, and solar power that is being generated from the home. During the hottest, brightest part of the day, solar energy can send electricity back into the grid, spinning your meter backwards and lowering your bills. Solar collectors can also be connected to your water heater to provide for up to 70% of the hot water needs for a family of three. Other options for utilizing renewable energy include installing solar tubes that will pull in natural light from the sun, and diffuse it into the home, cutting down on your reliance on lightbulbs. Read about our solar energy technology for our new office building in Edmonton here. If your home generates more power than it needs, you can sell power back to the power company in a process called net metering. On average each person in a home uses the washroom five times a day. Did you know that flushing a toilet can account for 35% of a household’s water usage? By switching to a low flow model, you can slash the amount of water used significantly. The same goes for shower heads and faucets. By switching to low flow models you can reduce your personal water use by upwards of 40%. When it comes to your hot water systems – tankless water heaters are able to provide instant and endless supplies of hot water, without requiring a holding tank to store pre-warmed water. They’re great both as a space saving solution, and as an efficient way to save on significant water heating costs. If your home is full of leaks and gaps, it’s going to make heating and cooling your home much less efficient. There are a lot of different ways to heat your home – and each brings with it its own levels of energy efficiency. Geothermal heating and cooling collects heat from the earth through buried pipes, which is then distributed throughout the home. Geothermal heating is a great option to consider with a new build – but pretty difficult to retrofit into an existing home. Radiant In Floor heating transfers warmth directly from the floor of a room – you’ll often see it installed in bathrooms, but can be a whole home solution, too. In floor heating offers a good solution to heating a home room-by-room, bringing needed heat only to the rooms you need. And of course, no net zero home is complete without a heat recovery ventilation (HRV) system to replace indoor air with fresh, clean outdoor air, but conserving heat energy so your heat stays in the house, and isn’t vented outdoors. We love homeowners with a green thumb, and help design beautiful green spaces for their property. But how do you keep a beautiful curb appeal without utilizing excessive amounts of water to keep everything green? Keeping mature trees on a property, and using natural landscapes, and native flora means you still have great curb appeal, but at the expense of less watering and attention. The everyday devices in your home need to be rated for energy efficiency. Energy Star rated appliances make a big difference! A new fridge uses 40% less energy than models produced before 1993. LED lights are more efficient, last longer, and have better performance in cold temperatures. Making the switch to LED all throughout your home can bring in significant savings on your energy use. Smart, programmable thermostats can automatically raise and lower the temperature in your home based on your routine. It can lower the temperature while you’re out of the home and at work, and automatically raise the temperature when you return, all without having to think about it. Even simple changes like lowering your thermostat by 3 degrees for 8 hours a day can save you 3 to 4% on your heating costs. 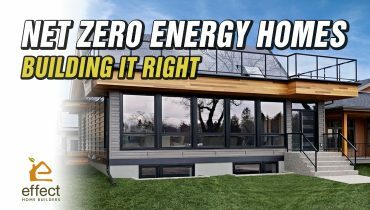 Is your next home going to be a net zero energy home? 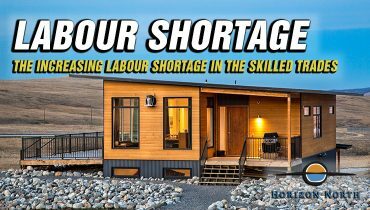 Give us a call at Effect Home Builders in Edmonton, Alberta today.